Sawyer Fredericks' original music is genuine and unfiltered—and his career is blossoming. Folk singer Sawyer Fredericks, at left, made his debut performance at Caffè Lena when he was 14. At 16, he won The Voice and had a SPAC gig. This May, he’s returning to Caffè Lena for a sold-out series of concerts. Homegrown, rooted, locally bred, organic, pure, raw. Much like the produce at the Greenfield Farmer’s Market where he loved to play, Sawyer Fredericks is all that—the real deal. He is a musical artist, a singer-songwriter with crystal clear blue eyes and long golden locks, singing original songs in his own unique style. His voice resonates with millions who feel it, too. Sitting on the front porch of his family’s farmhouse in the late daylight of spring, listening to Sawyer strum his guitar, there is no need, for the moment, to ask him questions. Sometimes answers come simply by observing. One of the dogs, a chocolate lab named Tanner, is at our feet, relentlessly wanting to play Frisbee. It is peaceful and serene—a relaxing immersion in the rural landscape. This philosophy probably gave him the ability to segue from his very private life on the farm to The Voice competition on NBC. “I actually didn’t go out for the open audition. They found me on YouTube. A scout found some of my farmer’s market videos and invited me to an audition, which was after the open call auditions. I auditioned twice before the actual live audition on TV. I wasn’t sure if I wanted to do it because it’s not my kind of thing. I didn’t really believe in putting music into a competition, and I was very introverted. Having all the cameras and interviews, that was very scary to me. Going into it, I really just had to think of it as a learning experience…all right, let’s see what happens.” And happen it did. Sawyer greets a steer named Hudson on the family farm. His choice to sing the traditional folksong “Simple Man” for his blind audition got him a four-chair turn. 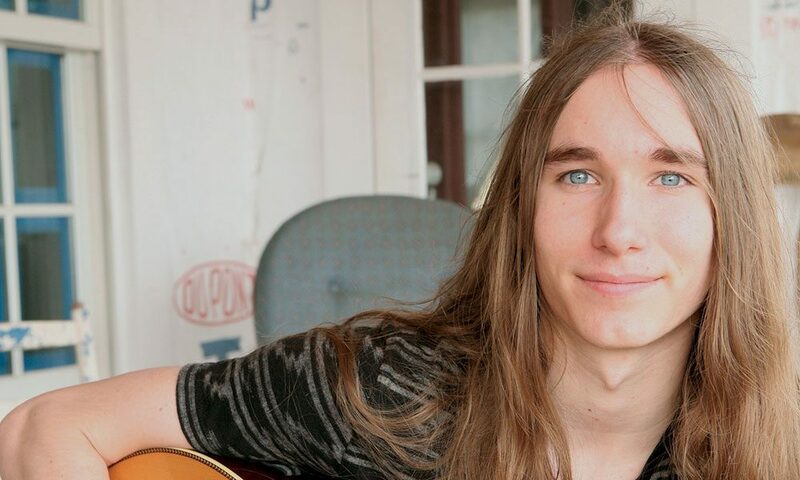 Ultimately, as the 2015 winner of The Voice—Season 8, 16-year-old Sawyer Fredericks, the youngest to win on the show watched by millions of people, was awarded a recording contract, a new car he gave to his parents, and a cash prize that he has invested into his new recording, publishing and touring companies. In 2016, Sawyer released his first major label album, A Good Storm, and toured throughout the United States, playing at over 70 locations. He wrote (or co-wrote) every song on the album. He is an independent artist now, no longer under contract with Republic Records. His eyes sparkle: “It means I have a lot more freedom with my music when I start recording my new record. I’m just excited to get into the studio and work on new music.” With his new band— cousin Arthur Lee Fredericks on bass, Chris Thomas on drums, and Jerome Goosman on guitar—Sawyer is looking for a more organic approach in a naturally flowing atmosphere. “Just figuring out how I want my songs to be recorded, and how I want them to work with a full band,” he says. He shares a bit about his creative process: “I just start playing guitar. I get the melody, and figure out what kind of story I want to tell, and kind of move from there.” Of his new project, he offers, “the themes in each song will connect to each other on the album,” which is expected to be out sometime this year. He seems to be most comfortable with his solitude, alone with his music. With the freedom now to choose his own path, Sawyer is also returning to the venue that made an indelible mark on his young career. At the end of May, he will perform on the newly renovated Caffè Lena stage in Saratoga Springs for a special three-night engagement, which sold out in less than eight hours. His fans are calling his Caffè Lena homecoming “Sawyertoga” Weekend. They are traveling from around the world, with one devoted fan traveling from South Africa. Caffè Lena, which holds the distinction of being the oldest continuously running coffee house in the country, has hosted thousands of young and seasoned artists since opening its doors in 1960, including the emerging Bob Dylan. Although the intimate, 118-seat venue is sold out for Sawyer’s return show, his fans around the world will be able to experience the show via a high-definition digital pay-per-view. Or they can catch his July 22 concert at the 2017 Paw Picnic in North Chatham, a benefit for the Columbia-Greene Humane Society. In conversation, he speaks the words “my fans” gently. “It means a lot to me, knowing that I have so many people supporting me who are interested in my music. It’s amazing having that many people listening.” Sawyer has an official fan club, a few not so “official” ones, and a huge following on Facebook, Twitter and Instagram. It’s a lot to think about and maintain, a task lovingly coordinated by his mom (and manager) Kirsten Fredericks. She says of her husband, Carl, and three sons, “All the boys don’t plan too far ahead. I’m the one with the calendar and the lists.” Her attention to detail allows Sawyer the space to create. “He’s very much in the moment. It’s a very healthy way of being,” she says. As we strolled around the farm, I met Django, a boar of impressive size; pigs and piglets; a new calf who will be named either Sergio or Sesame. I lingered by a fallen tree by the pond; Sawyer effortlessly climbed up it with his guitar. He seemed to be most comfortable with his solitude, alone with his music. Interviews may not be among his favorite things; nevertheless, he was genuine and unfiltered. It translates to his music. Some musicians reach out beyond words and melodies. Sawyer Fredericks has that gift.